Some of you probably realized that this is from the same family as ReFa Pro, which I’d reviewed back in 2011 and have been using almost daily since. It is actually closer in design to ReFa Carat, a beauty tool designed to mimic the kneading techniques of professional aestheticians. However, ReFa ACTIVEÂ is more than a beauty tool–it is designed as an advanced hybrid massage roller suitable for athletes who need to warm up their muscles prior to their sports activity or to relax their muscles after a rigorous training session. 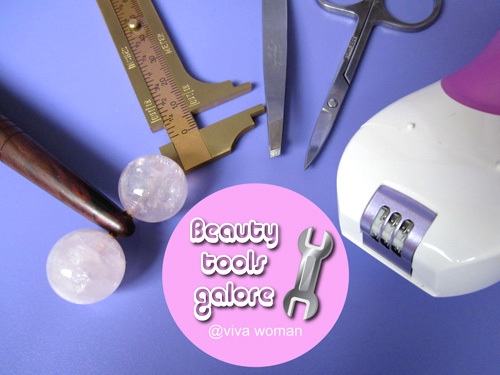 Okay, before you dismiss the tool as “out of your league” because you’re not an athlete or a sports fan, let me tell you why this product is worth considering if you’re in the market for a beauty tool. 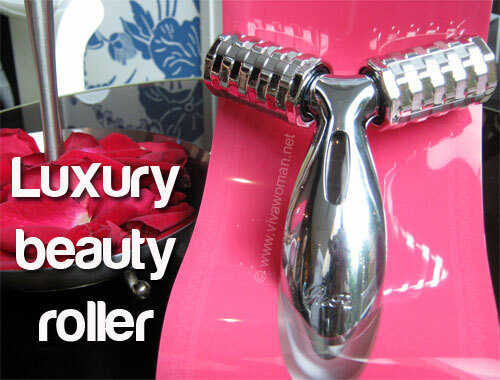 First off, even though it is designed with athletes in mind, it is first and foremost, a beauty tool. I mean, it is similar to ReFa Carat. So you can definitely use this to firm the skin on your face, neck or body. Yet if you’re leading an active lifestyle, you can also use this tool to warm up your muscles prior to your activity as the rolling movement improves blood flow, which warms up the muscles. And after your activity or workout, you can also use ReFa ACTIVE to help relieve those uncomfortable muscle tensions. I received a ReFa ACTIVE for a complimentary review and I like it–so much so that I’ve kinda ditched my ReFa Pro for the moment (which by the way is no longer available for sale). Let me precede my review by saying that I like my ReFa Pro. I didn’t like it that much initially but after using it for three years almost daily, there’s no denying that I love it dearly. 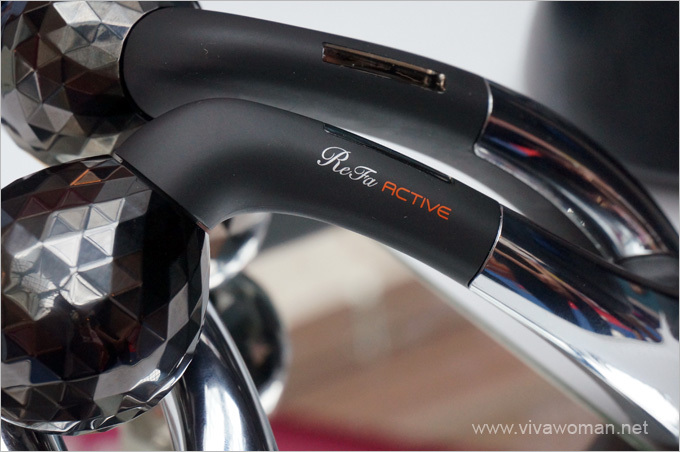 So why do I now like ReFa ACTIVE better? Well, because the new model comes with more enhanced features. 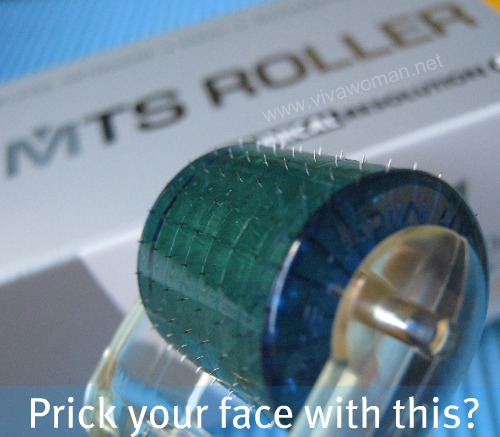 One, the multi-faceted round shaped rollers is designed to be better for kneading, and making it easy for me to target smaller areas, like around my eyes and my forehead. Second, the handle is so flexible that I can control the pressure I assert on a targeted area. Also, the rollers of ReFa ACTIVE can grip my flesh with better precision because the 440-hedron diamond-like shape rollers mimics the movement of pulling up and gently releasing my skin. So in that sense, I feel it can tighten my skin better. I also loan the unit to my husband for he’s a triathlete with many muscle issues. How did he find it? Well, let’s just say I had a difficult time asking for the unit to be returned. Granted, it didn’t help him resolve deep muscle injuries that he was hoping for but it must have brought some relief to hisÂ sore muscle tensions for he appeared to enjoy using it every night. Just like ReFa Pro, ReFa ACTIVE emits micro-currents but it does so by taking in light from the two solar panels placed on each side. What exactly is micro-current and how does it work for us? Well, human skin has a natural, extremely low electrical bio-current that flows through. As we age, our bio-current levels decreases and skin loses its elasticity and shine. So ReFa ACTIVE acts as a daily micro-current treatment that compensates for the reduction in bio-current levels while rejuvenating the skin and reactivating skin cells. And apparently, micro-current treatment was first used in the 1980s in America as a treatment for stroke victims and other patients suffering from partial paralysis of their face. The treatment helped to lift the paralysed muscles back into position, improving visages with drooping facial muscles. This micro-current treatment has since been adapted for use in non-surgical and cosmetic enhancement. Now, the million dollar question is, do such beauty tools really help? My answer is, yes, but provided you use it on a long term basis. I think if you’ve not been doing much for your skin, you might see results almost instantly upon using this tool. However, if your skin is quite well maintained, the difference is subtle. But the deal is, you do need to upkeep the state of your skin one way or another and such a tool makes it easier for you to maintain at home on a long term basis. You don’t have to believe me but I’m just sharing my thoughts as someone who has been using ReFa Pro consistently for three years. Should you be getting ReFa ACTIVE or ReFa Carat? I’ll say it really depends on your needs. If you’re using it mainly for your face, I’ll recommend ReFa Carat. But if you’re using it for your body too, I’ll say ReFa ACTIVE makes a better investment. So how much is ReFa ACTIVE? It’s S$450 and you have a choice of white or black. The good news for those of you sold on the idea of purchasing ReFa ACTIVE is that MTG is offering 10% off purchases from its e-store for Viva Woman readers. In fact, the 10% applies to all products. Just quote VivaMtg during checkout. For more information, check out the MTG e-store. Offer valid till end Oct 2014. Oh by the way, the ReFa series is now sold in Singapore directly by MTG, the Japanese company that created the products. You might like to know that in Japan, the ReFa Series is very popular and has sold over 2.5 million units thus far. And just to give you a heads up, I’m also testing the MTG Facial Fitness PAO and review will be coming up quite soon. It seems a good product because I have heard a lot about it before but today I clicked on this publication like that. After reading all, I see that there are lot of reasons that I should buy it. Well, if you do buy, I hope you’ll like it. Thanks Chenyze! I’m still tweaking the site but it should be cleaner with more space now. Sesame, Is the roller ball for Refa Active is bigger than Carat? No, they’re the same size.